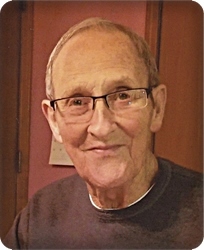 Billy C. Boggs, age 83, of Byron Center, went home to be with his Lord on Thursday, February 14, 2019. He will be lovingly remembered by is wife of 63 years, Marlene; his children, Kimberly (Richard) Ziomkowski, Renea Mc Garry, Jeffrey (Linda) Boggs, Carla Lipski, Tammy (Tim) Bigger; 13 grandchildren; nine great grandchildren; sisters, Sue (Joe) Arnold, Judy Ver Hulst, Anne Utter, and Peggy Grinnewald. The family will greet visitors on Monday, February 18, from 5 - 8 pm at Stroo Funeral Home and on Tuesday, February 19, from 10 - 10:45 am prior to the service at Good News Baptist Church, 6830 Eastern Ave. SE, where the funeral service will begin at 11 am. Rev. Brian Cederquist and Rev. Terry Frazine will officiate. Interment will be in Winchester Cemetery. Memorial contributions may be made to Good News Baptist Church Building Fund.